Day 81: Serifan’s Cosmic Cartridges! 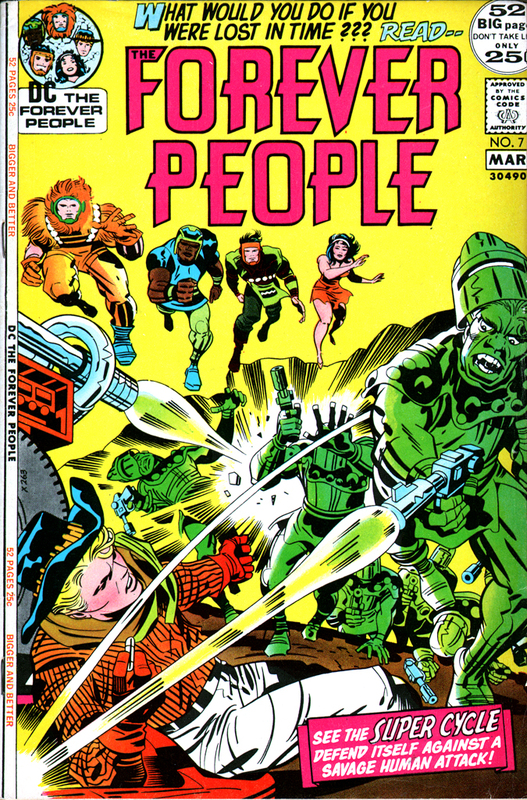 Posted 20 December 2010 in Day Entries, New Genesis, The Forever People #2, Weapons & Devices. Okay, let’s see: Beautiful Dreamer has the power to create illusions, Big Bear can concentrate his high-density atoms to the point of being invulnerable, Vykin has Magna-Power, and Mark Moonrider boasts the “Megaton Touch.” Now, what exactly does Serifan have up his sleeve…? Oh right, the copy-cat cowboy’s secret weapon is actually in his hat… Serifan’s hat-band, that is, which has loops to hold his myriad “Cosmic Cartridges,” each one having a specific — and often fantastic — power! It’s telling, I think, that Jack depicts Serifan handling his Cosmic Cartridges as if they were pistols on the cover of FP #7, seemingly ready to fire on the Justifiers attacking him! The kid would have loved to have seen such a heroic old Western pose as Jack drew… And adding up the number of cartridges here, that makes 12, enough for two six-shooters! So, Serifan is a rootin’-tootin’ six-Cosmic Cartridge shootin’ real cowboy, hombre! Cool beans! Posted 25 November 2010 in Day Entries, Heroes, New Genesis, The New Gods #1. His loyalty is not to Highfather but to the pursuit of knowledge, and Metron is willing to compromise the very survival of his home world, New Genesis, if Apokolips can help in finding the answers he desires. 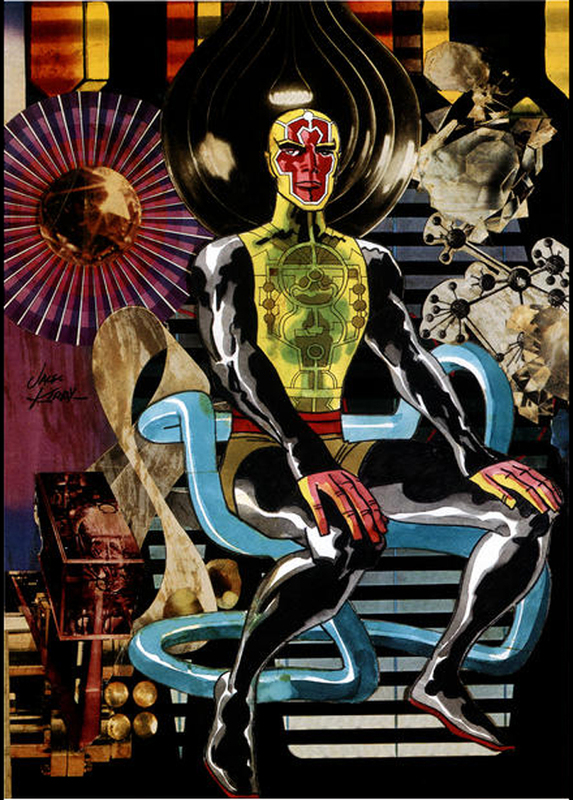 At worst, you could call him a traitor, a “supreme” meddler at best, but Metron sees himself in the loftiest of terms, justifying his cosmos-shaking intrigues by saying he is a seeker to questions about the ultimate power, The Source. 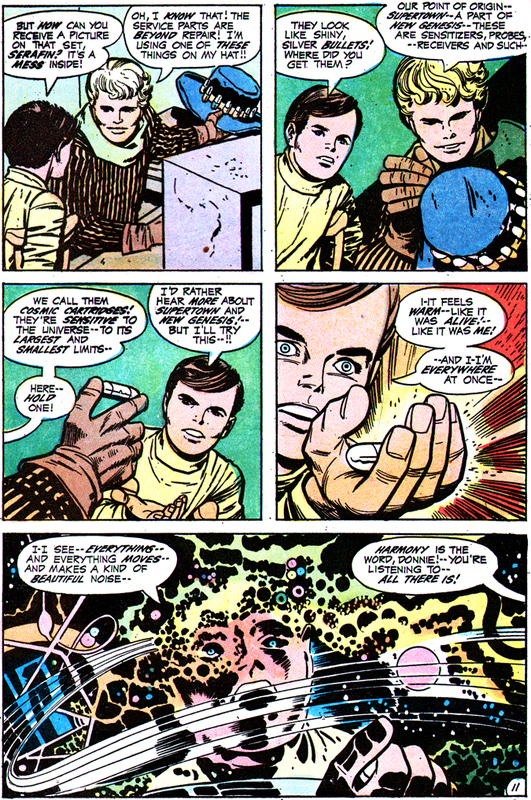 Metron is delusional in believing himself a mere humble scientist. 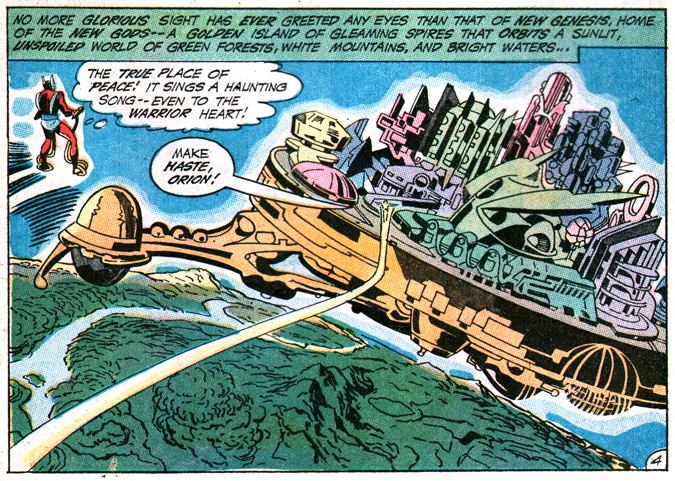 We’re never quite sure of Metron’s motives as he influences events at key moments in the Fourth World saga. He appears, usually, to be an ally of Orion, Lightray and company; but when the backstory of the epic is revealed, we find the seeker maneuvering players and events that portend cataclysmic repercussions. 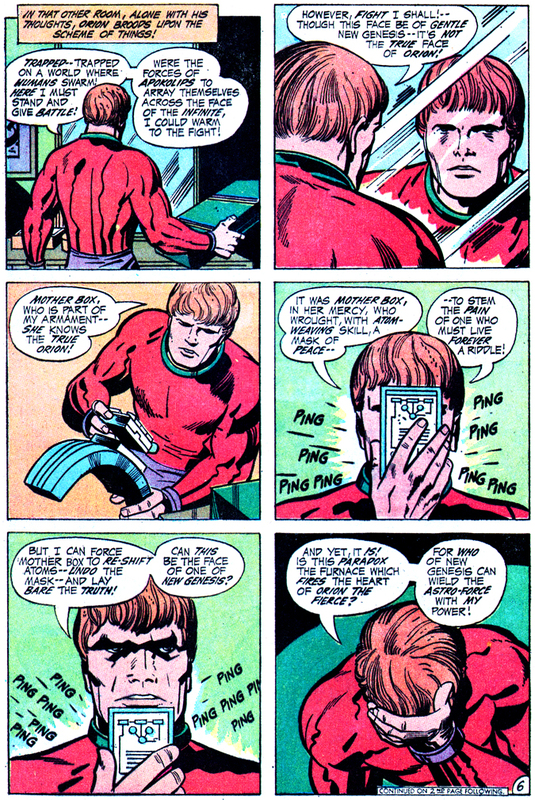 Frankly said, Metron is a schemer who manipulates people and events to serve his desires, not so unlike his professed mortal enemy (and sometime ally), Darkseid. Metron is the great inventor (if not the visionary) of both New Genesis and Apokolips, having first developed the “Matter Threshold,” which physically links the two worlds and was later refined as the Boom Tube. 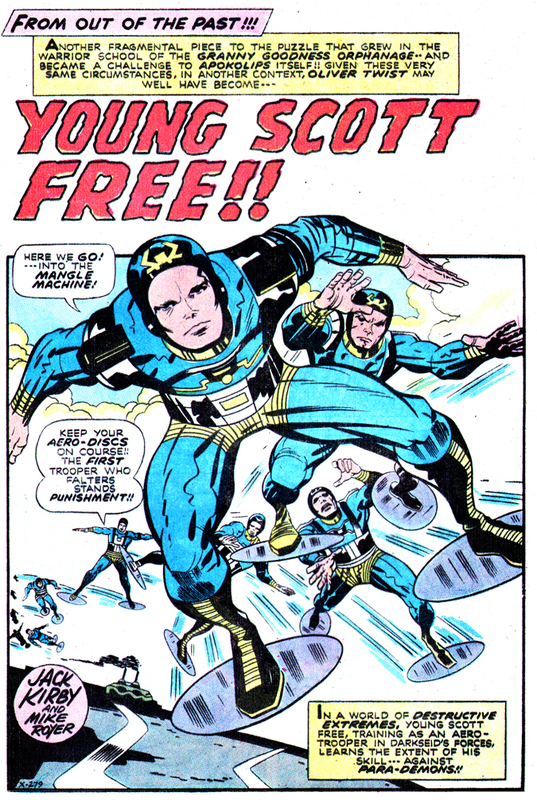 He is also incisively involved in seeing prophecy fulfilled, serving as a spirit who prods the son of Highfather at pivotal moments in the life of young Scott Free. 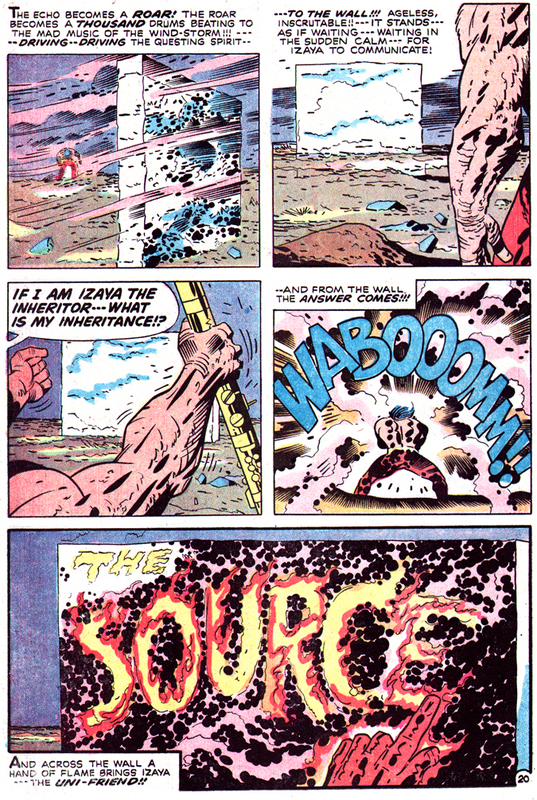 Early in the days of the “Great Clash,” Metron tries to seize the X-Element from Darkseid’s grip and we learn of the Master of Time and Space has been less than loyal to his native world, as the stone-face villain says, “On my conditions do you obtain it, Metron!! You recall our ‘private’ meetings! 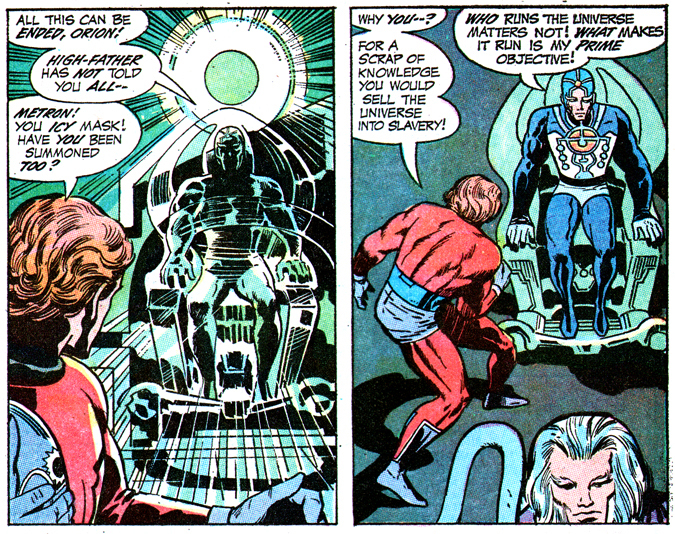 ?” And despite the fact Metron knows the armies of Apokolips will invade New Genesis “in the wink of an eye” if he follows Darkseid’s orders to create the “door to anywhere,” the Matter Threshold, all the seeker cares about is obtaining the “unobtainable” X-Element to build his Mobius Chair. 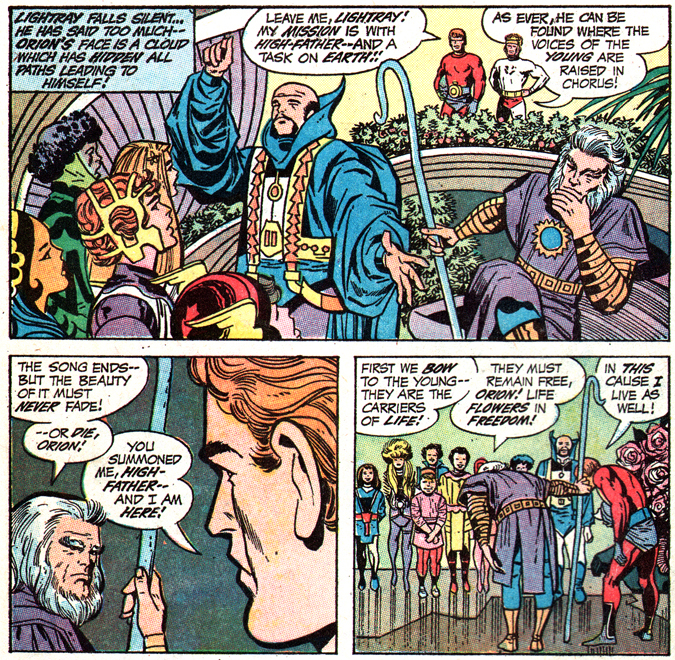 It’s difficult, also, not to see Metron as also a supreme believer in destiny, as the character appears time and time again to help his New Genesis brethren to escape their own predicaments: Metron delays the confrontation between Orion and Kalibak the Cruel, in the half-brothers’ first meeting as adults (quite probably to keep Orion in the dark, until the opportune moment, about his own direct lineage to Darkseid). 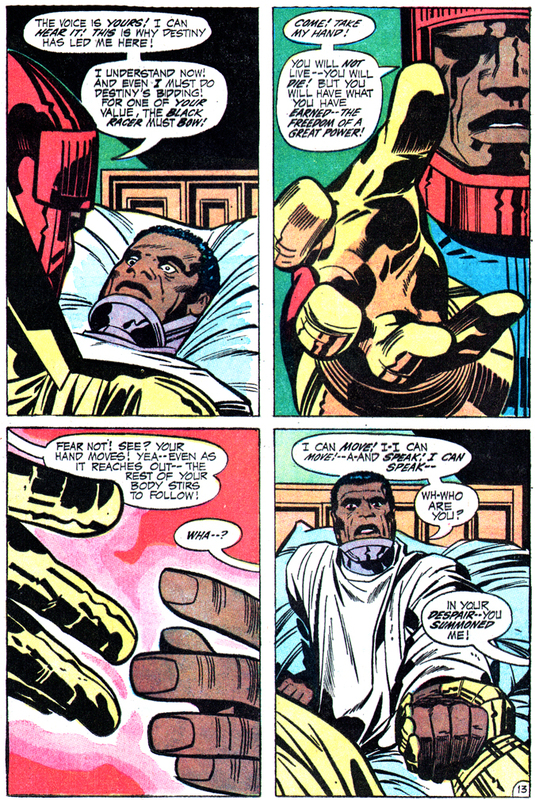 And immediately thereafter he explains the Apokoliptian threat not only to their home world, but to Earth and the entire known universe, to comrade Orion. 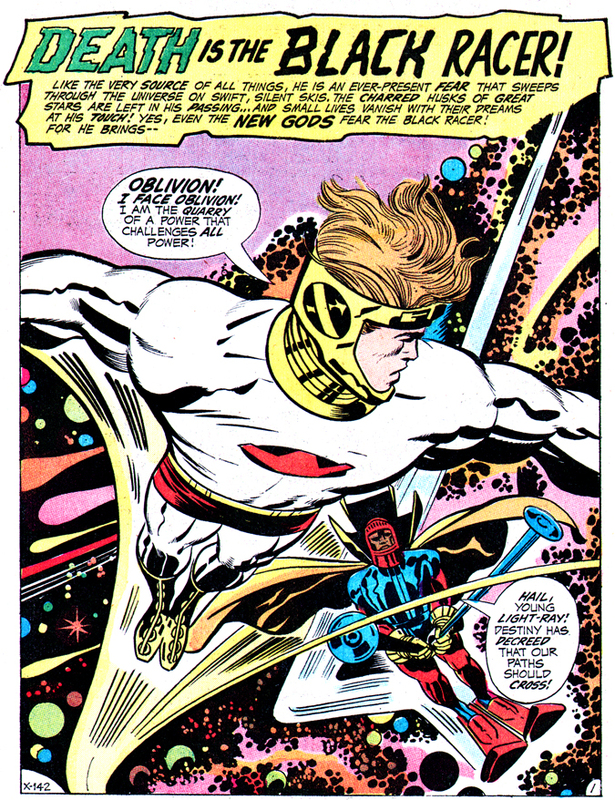 When Lightray is threatened with the final touch of The Black Racer, the bringer of death to the new gods, Metron intercedes by deflecting the cosmic skier to Earth, thereby igniting yet another chain of events, some not so good! A bit later on, Metron takes on the youngest new god, Esak, as student and travels the corridors of space and time to teach the boy, instilling in Esak a similiar unrelenting thirst for knowledge, one that just might have ferocious consequences at the grand finale of our epic. Most of all, perhaps, Metron is the embodiment of absolute conceit and self-aggrandizement, possessing a supreme lack of humility as he believes he is entitled to become privy to answers about the greatest mystery of eternity: the secret of The Source. “What wouldn’t I give to possess the knowledge of the ‘Source’!” In his Mobius Chair, he travels to the Final Barrier, confident he can accomplish what the Promethean Giants could not, and penetrate into the realm of infinity to discover the secret of life itself. In the end, Metron, “the seeker and wielder of cosmic knowledge,” may prove to have been the greatest, most ignorant fool of all. 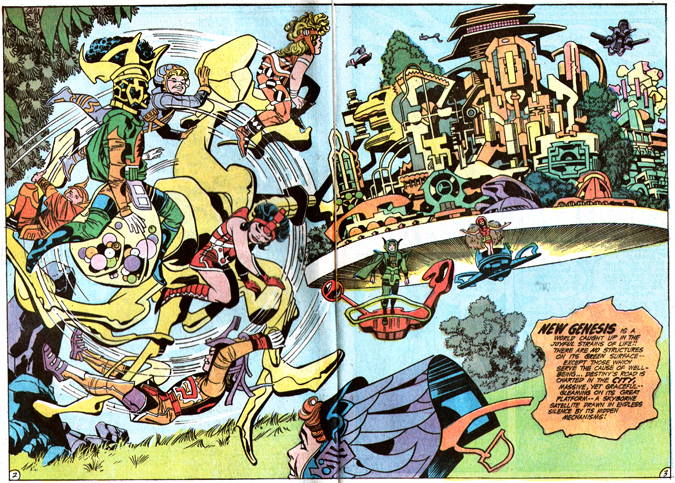 Posted 24 November 2010 in Apokolips, Day Entries, New Genesis, The New Gods #1, Weapons & Devices. The Source is connected from its unfathomable home to the Wall of the Uni-Friend, located in the Chamber of The Source in Supertown on New Genesis. 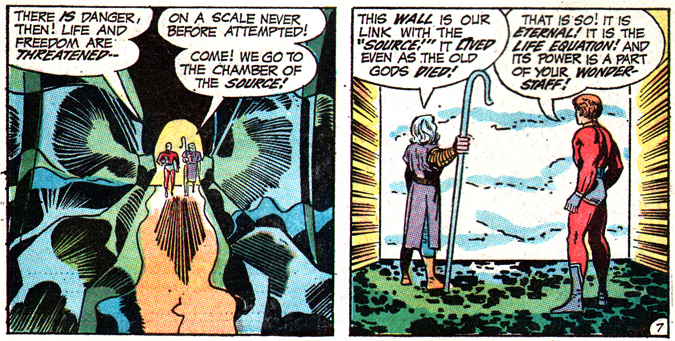 “This Wall is our link with the ‘Source!‘” says Highfather. And, via the Wall, it is linked with the New Genesis leader’s “Wonder-Staff” and all the Mother Boxes on his planet and Apokolips. “The dry wind rises and the elements disturb the sky!! Violent electrical flashes twist and stab across the darkened land!!! “The echo becomes a roar! The roar becomes a thousand drums beating to the mad music of the wind-storm!!! — driving — driving the questing spirit — to The Wall!!! Ageless, inscrutable!! — It stands — as if waiting — waiting in the sudden calm — for Izaya to communicate! “– And from the wall the answer comes!!! Posted 24 November 2010 in Day Entries, Heroes, New Genesis, The New Gods #1. 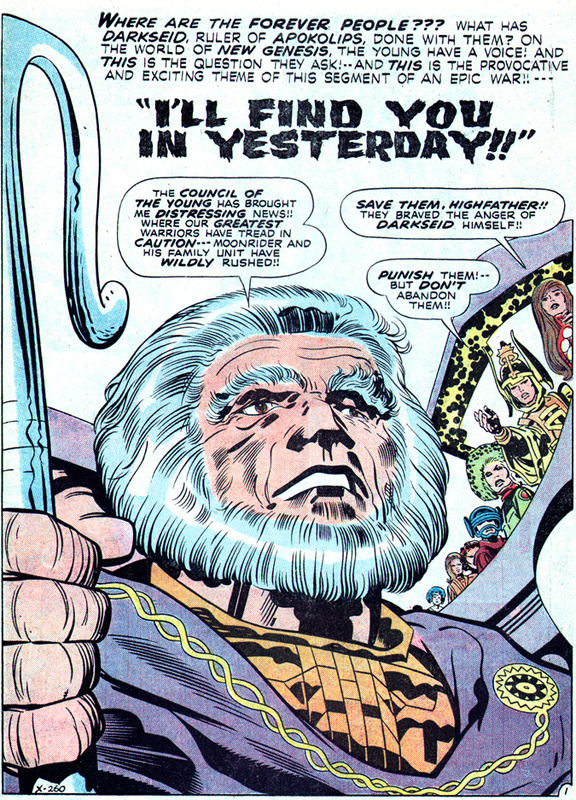 The bearded old gentleman with the “Wonder Staff” is none other than the solemn leader of New Genesis, Highfather, the true father of Scott (Mister Miracle) Free and stepparent of Orion the Wolf. He is the wise and benevolent ruler, seated in the satellite city of Supertown, who carries a great foreboding weight on his strong shoulders. 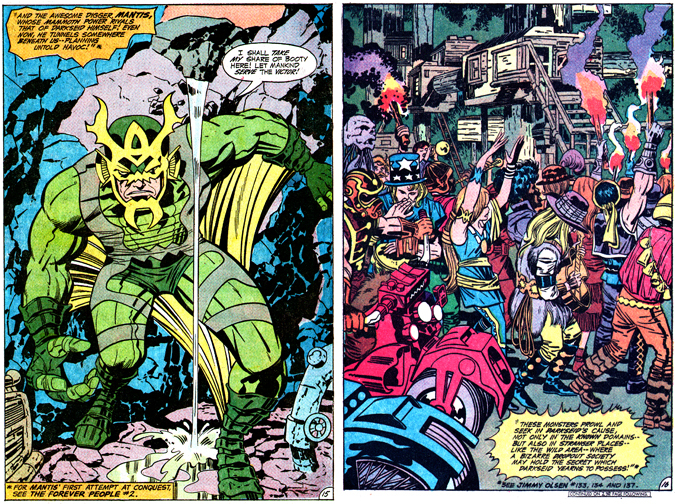 Suddenly the pair are interrupted by an illegal hunting party encroaching from Apokolips, among them Queen Heggra’s brother, arrogant Steppenwolf, and her beloved and conniving son, Darkseid. In the ensuing tussle, Avia is killed by Steppenwof’s radion bolt and Izaya’s unmoving body lays in the grass, apparently a victim of Darkseid. But the Inheritor is not dead. And so “The Great Clash” began and terrible and woeful violence was perpetrated against both sides, New Genesis and Apokolips, and war expanded exponentially — first air war, then ground war, then techno-cosmic war, the conflict growing until suns are destroyed and planets are hurled in the name of victory. Even the death of Avia’s killer fails to stop the conflagration. Each of the twin worlds pays a terrible price for Izaya’s vengeance and Darkseid’s ambition. In his lamentful sojourn, Izaya ponders the enemy. “Darkseid’s plan!! 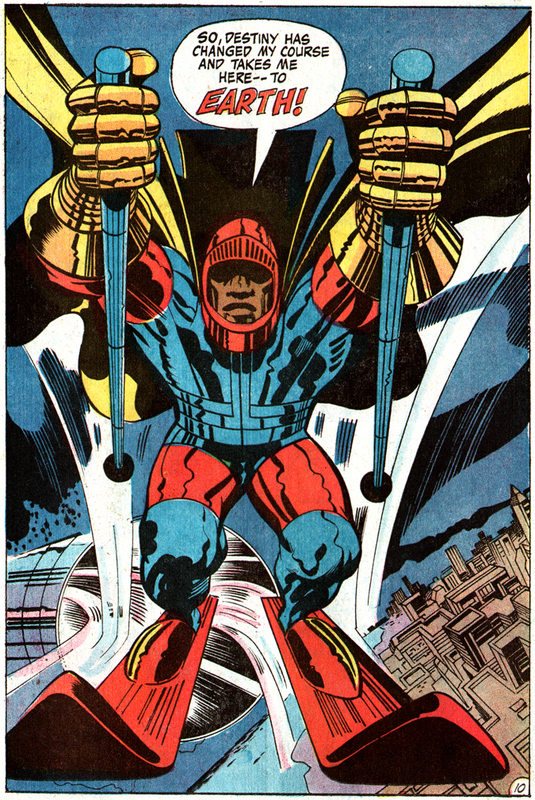 Like foolish Steppenwolf, I’ve allowed myself to follow the mad dreams of Darkseid!! — from which no one can survive!! !” Then, raging into the rising tempest winds, the Inheritor screams, “I tear off my armor! I reject this war-staff as a weapon!!! I reject the way of war! !” And still he staggers through roaring gusts and demanding his inheritance from whatever gods there be of gods, suddenly, there is revealed, The Source. From The Source, in messages spelled out by a mystical floating hand called the “Uni-Friend,” comes the essence of Greater Good, a new life for Izaya, now the Highfather, and his people. As leader, he is also obligated to answer the queries of The Council of the Young and he is especially attentive to the plight of The Forever People, even as the group disobeyed him by traveling to Earth. 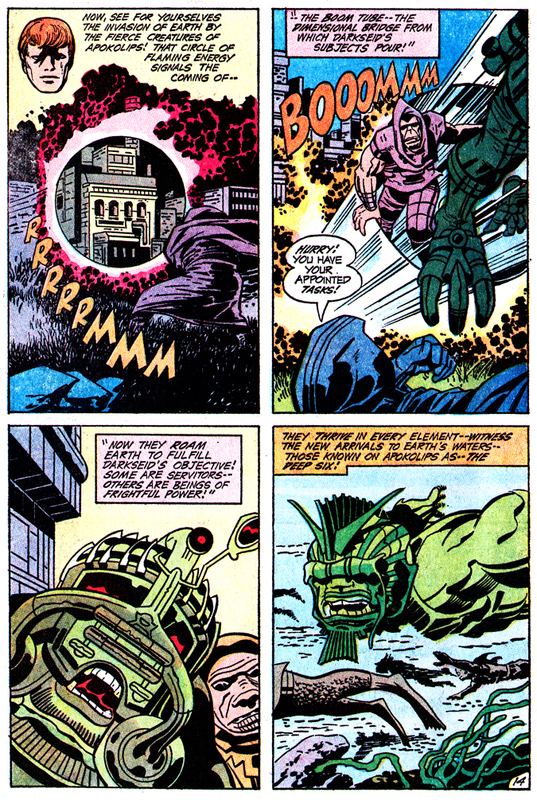 When the team is sent via Darkseid’s “Omega Effect” into past eras on our planet, Highfather intervenes by reuniting them courtesy of “Alpha-Bullets” shooting out of his fingertips. 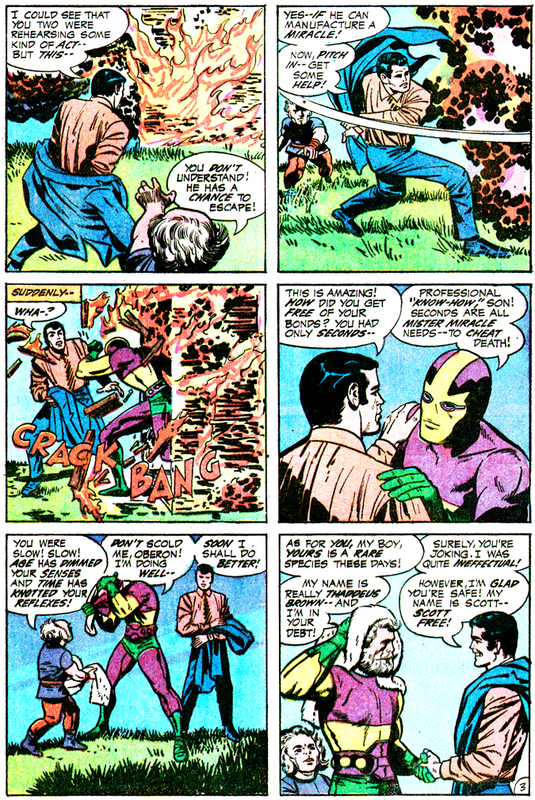 In a poignant exchange, Highfather engages one of the smallest of the new gods, who is asking for his help to rescue the Super-Kids. “Well, Esak!! Is one of the youngest of New Genesis to add his voice against my edicts! ?” asks Highfather.